The University of Illinois Springfield has empowered Briana Rodriguez to become an advocate for issues she believes are important. The sophomore legal studies major recently participated a rally in support of the Deferred Action for Childhood Arrivals (DACA) program at the Illinois State Capitol. Helping undocumented immigrants is an issue that Rodriguez is passionate about for personal reasons. Her grandparents immigrated to the United States from Mexico without documentation. They were given amnesty by President Ronald Reagan, which allowed them to raise their family in the United States. On campus, Rodriguez is a member of the Capital Scholars Honors Program, marketing director for the Organization of Latin American Students, a member the Hispanic/Latinx Mentorship Program and Gamma Phi Omega International Sorority, Inc.
“One of our sorority goals is community service and our chapter philanthropy is with M.E.R.C.Y. Communities, which provides homes for women who are escaping domestic violence or homelessness,” she said. Rodriguez, a Streamwood, Illinois native, is glad she chose the University of Illinois Springfield. Following graduation from UIS, Rodriguez would like to attend law school and become an immigration lawyer. She says the education and experiences she’s gaining at UIS are giving her the tools she needs for her future career. Benjamin Walsh, associate professor of management at the University of Illinois Springfield, has been named University Scholar for 2017. The award, considered the university system’s highest faculty honor, recognizes outstanding teaching and scholarship. 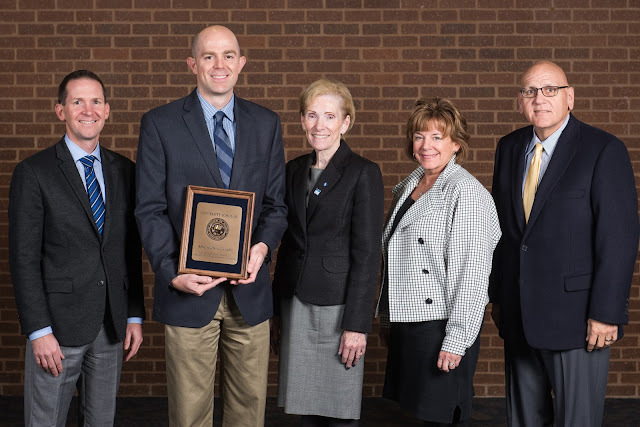 Only one faculty member receives the annual award at UIS. The majority of Walsh’s research focuses on interpersonal relationships in the workplace, with a particular focus on civility and mistreatment in the workplace. His research examines how work places have treated cases of incivility, with a focus on understanding the history and outcomes of incivility and sexual harassment, as well as the effectiveness of interventions designed to prevent workplace mistreatment. As a published researcher, Walsh has had 17 peer-reviewed journal articles in applied psychology and management journals, such as the Journal of Business Ethics, Journal of Occupational Health Psychology, Applied Psychology: An International Review, Stress and Health, and Journal of Business and Psychology. His scale measuring incivility in the workplace has also been published. “The impact of Dr. Walsh’s work is reflected in the 300+ citations his published research has obtained thus far,” said a nominator. In the classroom, Walsh is known as a true teacher-scholar who incorporates his own research interests, where appropriate, into his classes, encouraging students to develop critical thinking skills and an understanding of the research process. Walsh teaches courses in organizational behavior and human resource management, teaching at both the undergraduate and graduate levels and via face-to-face and online modes of delivery. Walsh has been successful in motivating and engaging students in his research projects, including two collaborative community projects. “Student perceptions of Professor Walsh’s teaching demonstrate that he is highly regarded, exceeding university, college, and department averages in every category,” said a nominator. Walsch received his Ph.D. in Industrial/Organizational Psychology from the University of Connecticut in 2011. In 2015, Walsh was named the 2015 Outstanding Faculty Member at the UIS Peoria Center. As University Scholar, Walsh will receive $15,000 a year for three years to support research and other scholarly activities. Faculty do not apply for this award; they are nominated by their peers. A committee of senior faculty makes the final selection. Melissa Van is getting a jumpstart on her future career at the University of Illinois Springfield where she helps promote student events on campus as the marketing chair for the Student Activities Committee (SAC). The business administration major is also the marketing coordinator for the Asian Student Organization, the vice president of the UIS Community Garden Club and a Capital Scholars Honors Program peer mentor. She says her involvement on campus has taught her many lessons about leadership. Following graduation from UIS, she plans to use the knowledge she’s obtained in the classroom and by marketing events at UIS to launch her career. The Lincoln, Illinois native says she chose UIS because “it wasn’t small, but it wasn’t big either.” She says she’s glad she made the decision to come to UIS. Garrett Nimmo enjoys being a voice for his fellow students. He was recently elected president of the University of Illinois Springfield Student Government Association (SGA) in a campus-wide race. As SGA president, Nimmo often meets with university leaders to express student positions on important issues. He also runs SGA meetings, making sure that senators have reports ready and are listening to student concerns. Nimmo, a sophomore economics major, was first elected to the SGA as a senator-at-large his freshman year. He found it easy to get quickly involved on campus. “From the moment you set foot on campus with the Kick Start Orientation, you’re actively given roles to participate in,” he said. One of Nimmo’s other leadership roles is a mentor for Leadership for Life, a service and leadership program where students complete 40 hours of service each semester. As part of Leadership for Life, he traveled to Baton Rouge, Louisiana to clean up flood damage in 2016. He also went on the 2017 Alternative Spring Break trip and helped with outdoor eco-restoration projects along the Florida Panhandle Gulf Coast. Following graduation from UIS, Nimmo would like to attend law school and become a public servant or tax lawyer. Nimmo says he’s grateful for the confidence students have placed in him and hopes to represent them to the best of his ability. Jasmin Lisowski has been playing soccer since she was in kindergarten. Now, she’s living her dream playing NCAA Division II women’s soccer at the University of Illinois Springfield, while majoring in social work and psychology. On the UIS women’s soccer team, Lisowski has taken on an unofficial leadership role, helping to mentor new players. She admits that she wasn’t always a vocal member of the team, but says UIS helped her step up and become a leader. On campus, Lisowski is part of the Student-Athlete Advisory Committee (SAAC), the Alpha Lambda Delta Honors Society, the Capital Scholars Honors Program and the Psi Chi National Honor Society in psychology. She also traveled to the Florida Gulf Coast in March 2017 to volunteer with the Alternative Spring Break Program. Most recently, Lisowski completed a study abroad trip to Malta and Rome in May 2017. As a student-athlete, she says it can be hard to travel during the summer months. However, she arranged her schedule so she could take part in the trip. “It was an amazing experience. I was so excited to be able to do that,” she said. Following graduation from UIS, Lisowski plans to earn her master’s degree and become a counselor or social worker in an emergency room. Lisowski says she is glad that she chose UIS because she enjoys being part of a growing campus that is part of the University of Illinois System. She has also enjoyed the positive student-athlete experience and recommends UIS to others interested in playing sports.